Altona’s connection with the storage of explosives goes back to 1884 when the hulk “Sydney Griffiths” was anchored in Laverton Bay (now Altona Bay) and loaded with explosives. The practice at this time was to store explosives in hulks in the bay and in the magazines near Footscray. Due to the ever present danger in these methods of storage, the Government decided in 1891 to build an explosives storage area at Skeleton Creek, Laverton. In 1897, the Victorian Government acquired the reserve of 550 acres and opened it on 1st May, 1901, with 26 magazines with a total capacity of 500 tons. A 2-ft. gauge horse-drawn tramway from the reserve to Laverton Railway Station for the transportation of explosives was constructed, and a pier for transport by sea was built. The capacity of the reserve grew to 1,000 tons and in special cases 1,100 in 61 magazines. For many years it was a familiar sight to see explosives ships anchored off Point Cook whilst red lighters (barges) plied their way to and from the explosives pier. 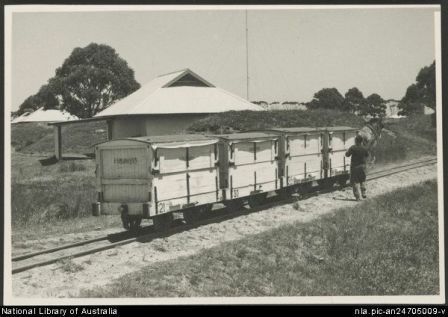 The tramline to Laverton Station was closed about 1943, although the portion inside the reserve was used until the reserve closed and explosives were taken by road truck to and from Deer Park explosives works on a special road. Due to Altona’s increasing population after Wold War II the Government closed the majority of the reserve in 1962 and moved to Point Wilson (near Geelong). A small section still remains for special purposes. About 50 persons living in 15 houses scattered over the area. Some water, no public transport, no doctors, no hospital, few shops, no schools and little (if any) made roads.